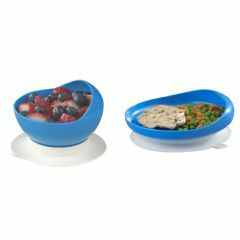 The Scooper Bowl and Plate each have a high rim and reverse curve on one side aids in scooping food onto a utensil without spilling. The bottom of the dish has a rubber suction base to prevent skidding. Molded of heat-resistant plastic. Hemispherical, 4 1/2¨ (11.4 cm) diameter. Stays in Place. Easy to Use. Durable. they are small portion bowls and plates. I thought they would have been the size of normal plates and bowls. They are more portion for a child than adult. My husband had a stroke and lost the use of his left arm/hand so this really helped him when I can get the rubber to stay on the bottom of the dish. It's hard to get on and then once you use it and you lift the rubber from the platform of where it was being used, the rubber comes off. Stays in Place. Can Withstand Use. Easy to Use. My husband had a stroke and lost the use of his left arm/hand so this really helped him. Stays in Place. Easy to Use. Good Value. very small. Good value but was dissappoinyed with the size.